One of my favourite and most consumed styles of tea is Light Roast Oolong, like Light Roast Shan Lin Shi or Tsui Feng Supreme. I find this style incredibly versatile. It represents the optimum combination of easy handling, straight forward brewing, stunning flavours and aromas and a perfect balance of the soothing and comforting effect and the uplifting kick you get from tea drinking. These teas come from the very same great Luanze cultivar that thrives in high altitudes, producing some of the most impressive Oolongs there are. And the best Light Roast varieties will come from the highest altitude tea gardens, same as with Green Hign Mountain Oolongs. Roasting is applied not to hide problems of poor quality leaves but to highlight the best characteristics a well grown tea already has. Roasting is a complex art and one must be greatly skilled to produce well balanced Light Roast Tea. In this style of tea only gentle roasting is applied, and the roasted leaves visually are not much different from their green siblings like Ali Shan and Top Grade Tsui Feng. They do not change their colour or shape but the roasting does affect their aroma, flavour and properties. Comparing to the green style High Mountain Oolong the Light Roast varieties are more mellow. Roasting neutralises some of the stimulants making them gently energising but easy on your stomach. 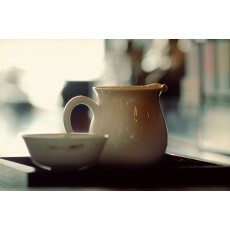 They embody all the great qualities of a High Mountain Oolong tea, but are more subtle. The strong floral character is evened out by the nuttiness of roasting, the bold greenness is balanced out by the warming burned sugar tone. For every day / on-the-go drinking add half teaspoon of Light Roast Shan Lin Shi to a mug or a Fuguang Flask, top up with water just off boil (around 90C is perfect), enjoy and keep adding more water to the same leaves throughout the day. For a treat use a Gaiwan or a high density Yixing Pot and 3..4g of the same or Tsui Feng Supreme leaves. Rinse briefly with 90C water and enjoy the sweet, honeyed aroma with a mild floral undertone that your leaves will be producing at this moment. Prepare your first infusion of about 30..40 seconds and enjoy the amazing complexity of aromas raising from your cup. Take a sip of the tea, and pull in a small amount of air through your mouth. Enjoy the silky texture and lively tone of the High Mountain Oolong. While holding the tea in your mouth, slowly exhale through you nose and you'll feel the toasty sweetness of the infusion gathering at the back of your throat. Then swallow the sip and enjoy the long lasting aftertaste. Each following infusion can be about 15 seconds longer. Keep brewing until all the flavour is gone. 0 Comments To "Light Roast Oolong"